Developer Martin Selig says he’s added another prime parcel to his Seattle real-estate empire — the Firestone auto repair shop on Westlake Avenue North in South Lake Union — even as the 78-year-old plows ahead with seven other projects. Developer Martin Selig says he’s adding another prime parcel to his Seattle real-estate empire — the Firestone auto-repair shop on Westlake Ave. N. in South Lake Union — even as the 78-year-old plows ahead with seven other projects. Selig said he’s buying the nearly half-acre parcel in the heart of Amazon.com’s corporate campus. He clinched the deal last week though he can’t disclose the price until it closes in late November. “I’m in the middle of it all,” Selig said Wednesday. The Art Deco-style auto garage was built for the Firestone Tire & Rubber Co. in 1929, when the South Lake Union neighborhood was Seattle’s auto row. Bridgestone Americas, which owns the parcel at 400 Westlake Ave. N., didn’t respond to a request for comment. Selig said he plans to build about 150,000 square feet of office and 17,500 square feet of ground-floor retail. At least two floors will be designed for biotech use. The building could open in late 2017 or early 2018. Besides Amazon, the parcel at the northeast corner of Westlake and Harrison streets is near the headquarters of Group Health, the Institute for Systems Biology and Juno Therapeutics. The project is the latest for Selig, who controls some 4 million square feet of buildings in Seattle and has about 1.5 million square feet in various stages of development. He said his vacancy rate across the portfolio is less than 2 percent, about as good as it gets. Earlier this year, Selig also acquired two parcels on Third Avenue, south of Virginia Street, in separate transactions for a total $14 million, public records show. 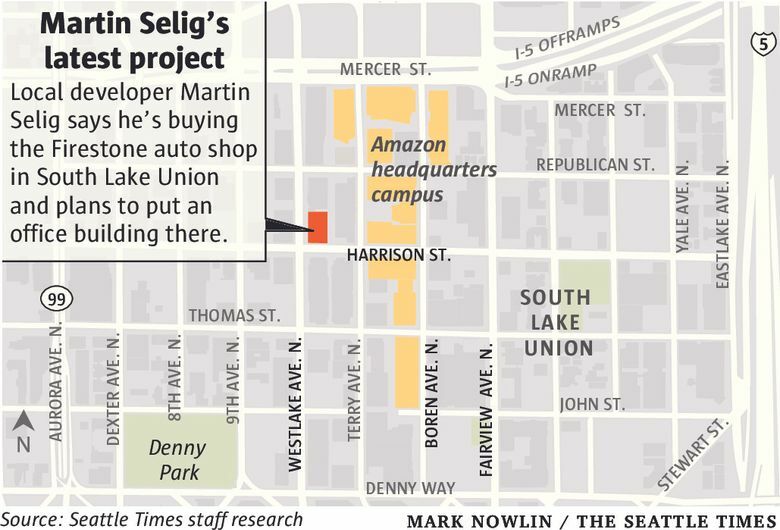 Selig said he is exploring an apartment tower at that Belltown corner. Selig also wants to develop three parcels on Third Avenue and Lenora Street that his firm acquired a year ago from multiple sellers for $16.9 million. On the 19,440-square-foot assemblage, Selig recently proposed to build a 38-story tower, with about 195,400 square feet of offices and 384 apartments, according to city records. Selig picked up the former Federal Reserve Building at 1015 Second Ave. in a government auction earlier this year and had proposed to develop a new 31-story office tower above it. Now, Selig said his firm is considering putting apartments on top of the offices so he can build higher. Next year, the company expects to open Third & Battery, a 68,429-square-foot office building that’s mostly leased to Antioch University and Sound Community Bank, and Third & Harrison, a 185,087-square-foot office building on Lower Queen Anne that will be the new headquarters for Holland America Line, a Seattle-based operator of cruise ships.